The Hawks haven't played on Christmas Day in 21 years but, in their last two Christmas Day games (1987 and 1989), two Atlanta Hawks (pictured together below in a scanned newspaper photo circa the 1986 All-Star Game in Dallas) provided their fans with holiday delights, displays that rank among the top 15 individual Christmas Day performances since 1986. 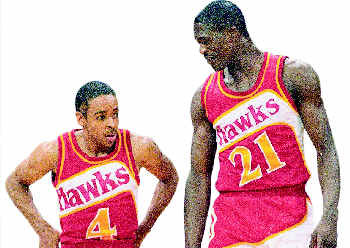 On December 25th, 1987 in Philadelphia, Dominique Wilkins scored 45 points on 28 shots, grabbed 9 rebounds, and earned 3 assists to lead the Hawks over the 76ers 106-100. Neil Paine's adjusted plus/minus game score ranks this as the 15th-best individual Christmas Day performance since 1986. John Hollinger's game score ranks this as the 4th-best individual Christmas Day performance since 1986. And neither metric gives 'Nique extra credit for dragging Jon Koncak, Scott Hastings, and Chris Washburn along for the victory. Two years later, the Hawks hosted Cleveland on Christmas Day. That 115-104 victory was far more of a team effort: all 5 starters scored in double figures (Wilkins, Moses Malone, and Spud Webb each tallied at least 20 points) and Cliff Levingston chipped in 9 points and 7 boards off the bench. Webb, though, was the unquestioned star of the day, scoring 26 points on 14 shots, grabbing 6 rebounds, earning 12 assists, and committing just 1 turnover. Paine's game score rates this the 3rd-best individual Christmas Day performance since 1986. Hollinger's version ranks Webb 6th.